New Videos Posted. Visit our Classes to Watch! Welcome to Classroom Moments. Each season we produce 24 brief, educational videos on subjects including History, Science, Math, English, Vocabulary and Art. Created using Core Curriculum Standards and hosted by young people, these videos provide an entertaining and exciting way to introduce key topics, and engage young people in discussions. We invite you to explore the site, watch our sample videos. And, watch for Classroom Moments on Television Stations near you! 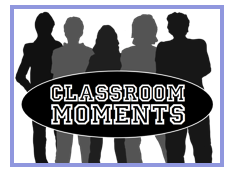 Classroom Moments is a video and lesson program designed to provide an ever expanding library of resources for teachers, parents and homeschoolers. Get Classroom Delivered to Your Home! Build your own library at home. Make sure you can utilize every lesson on DVD. Short (1-3 minute) videos, hosted by kids, specifically designed to make subjects such as English, Math, Science, History and the Arts interesting and engaging. Our unique program also includes cross-subject lessons. For example, we might discuss how literature and history impact each other, or how science and math overlap on a particular lesson. Take some time to look around the site.